Gil Atzmon is Professor of Human Biology at Haifa University in Israel, where he runs the Laboratory of Genetics and Epigenetics of Aging and Longevity, and at Albert Einstein College of Medicine in New York. The foremost focus of Prof. Gil Atzmon’s entire research career has been the understanding of the association of the whole genome to disease, performance, health and longevity. 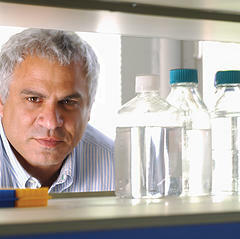 Since 2001, he has focused on human genome and its impact on aging and longevity. One of the highlights was the identification of several longevity associated genes. These genes, in association with large lipoprotein particle sizes, may protect from a variety of diseases such as dementia, diabetes, hypertension and coronary heart disease and may lead to potential new treatments. This observation led to screening of whole-genome utilizing high-throughput technology for genes associated with longevity. In more recent years his focus has shifted to a new and challenging field involving the role of epigenetics in aging and longevity. Conducting a genome-wide cytosine methylation (HELPtag assay), he demonstrated (at conferences as an invited speaker in Orlando, Florida, 2013, New York, 2013, Beer Sheva, Israel, 2013, Brooklyn, NY, 2012, London, UK, 2012, Toronto, Canada, 2012, Bethesda, Maryland, 2012, Ventura, California, 2012, Santa Barbara, California, 2009, and as a presentation in ASHG Honolulu, Hawaii, 2009 and Santa Barbara, California, 2012) that there are epigenetic differences between centenarian and control samples, and that extremely old people share a common pattern of altered methylation that distinguishes them from young unrelated controls. Using Sequenom’s MassARRAY technology, he validated the candidate methylated loci results from the whole genome methylation scan, and demonstrated expression differences of those candidates in normal aged versus long-lived individuals. Currently, Prof. Atzmon explores healthy longevity promoting loci by using one of the best models for successful healthy longevity – the Israeli Multi-ethnic Centenarian Study.